50 years after the 1958 World's Fair, Brussels is an international city and the capital of Europe (and even Mini Europe), with a large, silvery, glob like thing as a reminder of the Jubilee of hosting the World's Fair. I am off to Brussels for the weekend. It’s my third trip to this place in the last 4 years, which if you exclude places I have gone for work means I have visited Brussels more than any other city save Paris and London (which might not even count, because I actually live there). I must really like this place. Truth is, I do like this place. It is a nice mix of old and new. It is small enough to be human scaled, but large enough to have anything you might want. Finally, as the capital of Europe, it is very international, and you never feel out of place as a foreigner here, for so many people seem to be from some place else. I got a great deal on a hotel, as well. 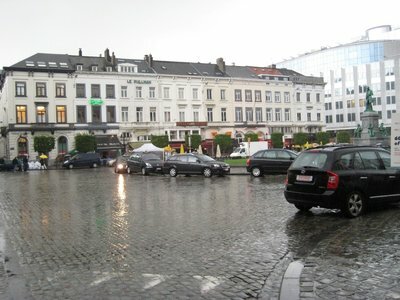 The Renaissance Brussels Hotel near Luxembourg Square was on for just €99. Having already been here twice and having stayed at hotels near the centre, I decided to stay some place a little less central (i.e. touristy) and a little more “real” (i.e. where there aren’t so many tourists). The Renaissance is just steps from the European Parliament, so it is usually filled with Euro politicos trying to sway the balance of power in their favour (as politicos are wont to do). The area surrounding the parliament is more residential than the core of the city around the Grand Palace, so it’s both more quiet (i.e. less drunk Brits) and more lively (i.e. more locals out for a Friday night dinner and drinks). Having already seen the beautiful yet highly touristed Grand Palace and main square, I decided to head out to an attraction that I hadn’t visited on my last two visits. 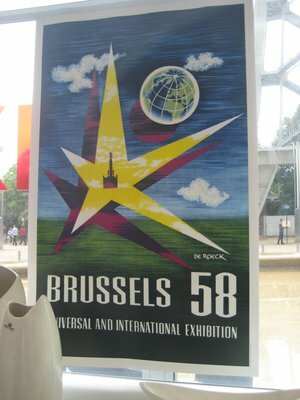 50 years ago, in 1958, the World’s Fair found itself in Brussels. 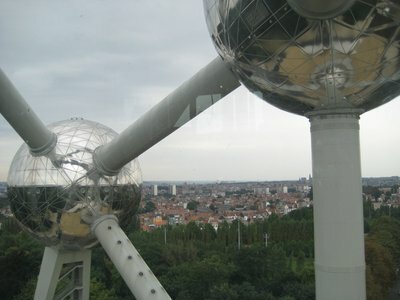 One of the displays was The Atomium, a massive construction made to look like an atom, with orbs of shiny silver connected together by gleaming white tunnels. 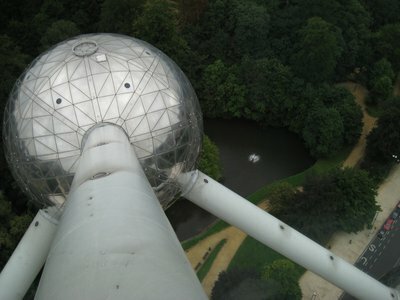 Not much remains of the 1958 World’s Fair, but The Atomium still stands today. The Atomium is one of those things that seems underwhelming when you see it in tourist guides or city brochures. The pictures of the place always made it look like it’s some crappy 20 foot tall structure in some abandoned car park out on the outskirts of town. 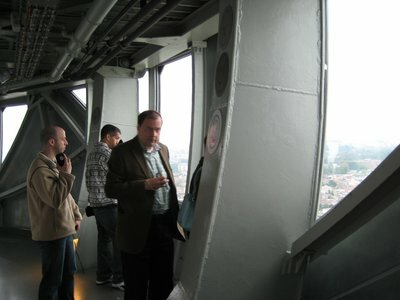 Going there, you realize that all those pictures have failed to correctly capture the scale of the Atomium. In fact, it is 102 metres tall. It is composed of nine steel spheres and apparently is designed after a cell of an iron crystal magnified 165 billion times. I took a few pictures, for example the one below, which seems to make all the same mistakes as the tourist brochures by trying to get the whole thing in one picture, which ultimately makes it seem small. Instead, here’s some pictures I took that I hope do present the scale correctly. Looking down at another orb from the top of the 9 orbs, with a fountain down on the ground, way below! 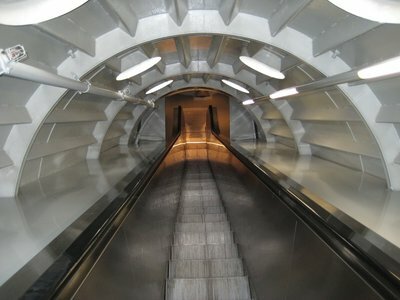 The escalator rides between orbs, through the white connectors, can be a bit of a trek. Next up, I headed over to Mini Europe! Mini Europe promises (according to the free guide that you get when you pay admission) AN EXCITING VOYAGE THROUGH EUROPE! Mini Europe is what we would call in Canada a “miniature village.” That is, it is a number of real and imagined buildings modelled at some scale and displayed for visitors. The guide book, in addition to describing the sights, also gives lots of information on the values of the Europe, the economic and political power of Europe, the powers and duties of the European parliament, European budgets and GDPs, European currency and why Europeans can’t make a decent chicken wing in their sports bars. Okay, all but one of the above topics is covered in the handout. Finally, headed back to Luxembourg Square near my hotel and grabbed dinner and drinks at Fat Boy’s. 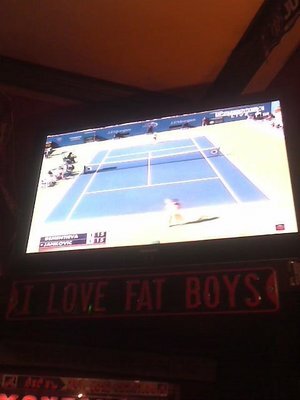 Fat Boy’s is a sports bar run by an American, and so I found myself sitting in Brussels, drinking Danish beer, watching British Rugby and eating an all-American cheese burger. I sat at the bar and had a few more pints while sports rotated before me on the televisions screens. American baseball, American football (on the Armed Forced Network, no less - which is just like regular TV, but with more commercials for West Pointe and PSAs on Why Not To Sexual Molest Teenagers In Iraq) and Tennis. With that image I end, for it seems a fitting one for Brussels, a mix and match of cultures coming together in one place. I have never been to Brussels before it became the European capital so perhaps this is too grand a statement to make, but I think it was an excellent choice. It seems like a place where anyone, no matter where they are from, can come and project themselves into without seeming out of place. 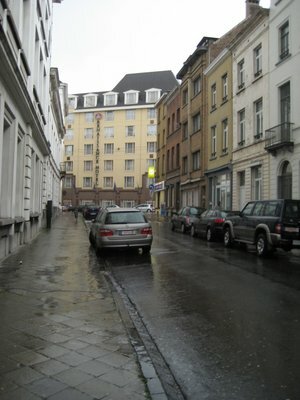 Edited to add: I realized I never explained the title of the Blog - Brussels Happiness. Brussels Happiness is the name of the series of events that Brussels has or is putting on from April until October of this year to celebrate the 50th anniversary of the World's Fair in 1958, including a number of exhibits that I saw at the Atomium and the creation just down the street of The Pavilion of Temporary Happiness, made (fitting for Belgium) of 33,000 beer crates. 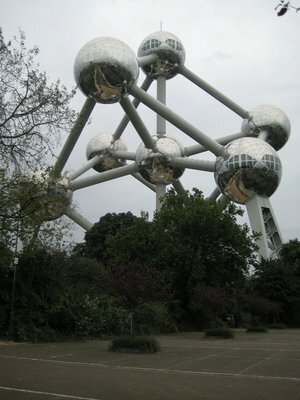 A list of all the events can be found at the Atomium website, in the event you are going to be in Brussels and want to see the world's largest atom juxtaposed against the miniature version of Europe housed next door to it. I also added the picture of the TV showing the tennis which I meant to originally include, but somehow managed not to at the last moment. Finally, I realize many people have already read this, and will never see this addendum. Such is life.